There’s a method to help you on your way. 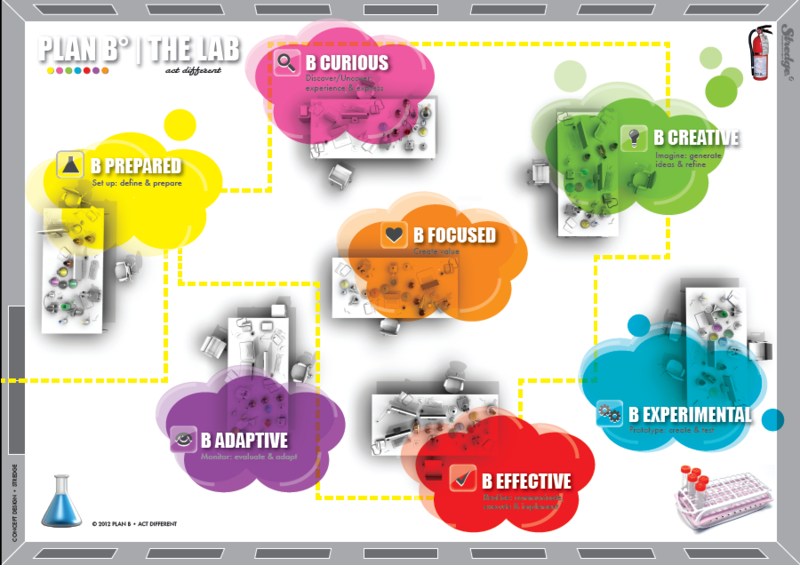 It’s called “The Lab”: a roadmap with six (+1) phases. The Plan B method isn’t a tight linear process, with ‘closed’ steps defined. The six phases are all in relation to one another and there will always be switches between them. Just as in our ‘normal lives’. Of course, there’s is a certain direction in the process, which will help you get moving. Set up: define & prepare. Starting the journey, exploration, defining your challenge, system and (shared and individual) values and interests. Discover/Uncover. Investigate and understand, discover and uncover the situation, causes and needs. Experience & Express. Value is the ‘stage’ in the middle of the process. This is the central point of focus, so you fully understand where you are headed, what your goal is and what the value is you want to create and for whom. Imagine. Be creative, generate lots of amazing ideas and select the most powerful idea(s). Prototype: create & test. Design concepts, come out of the abstract zone and make your idea tangible in order to test and refine. Make it feasible, convince, tell the story. And realize: make it all happen. Evaluate and monitor the solution, adapt, improve, make it a cyclical process.